The Home Bazaar Hobbit House combines form and function seamlessly, providing an elegant place for your favorite birds to live. 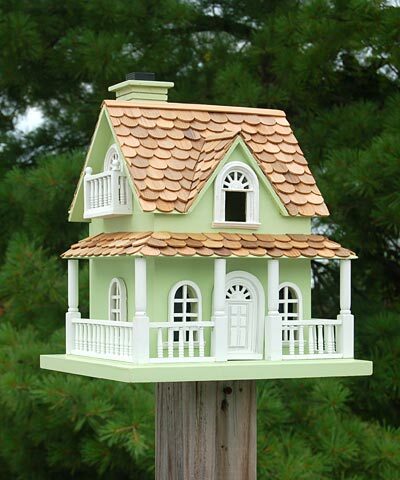 Exquisitely detailed, this bird house replicates every detail of a whimsical country cottage. Painted in an eye-catching pale green, the home features three stories of wonderful detail including a chimney, a wrap around porch with side balconies, and real layered cedar shingles. The house is designed with a single 1" x 1.25" square entrance on the top floor that leads into a roomy interior. The back panel is fully removable for easy cleaning. Constructed of kiln-dried hardwood and exterior grade ply-board the Home Bazaar Hobbit House will surely last your feathered friends through many seasons. Note: Should you want to preserve the finish (paint) of this home, you should select a polyurethane product that is recommended for marine use (UV Rated) that will not turn the white paint yellow. You should expect that once left outside, the house will weather and require refinishing.